Tampa, Florida is a great place to live, work and play. According to Wikipedia, Tampa was ranked as the 5th best outdoor city by Forbes in 2008. Tampa also ranks as the fifth most popular American city, based on where people want to live, according to a 2009 Pew Research Center study. A 2004 survey by the NYU newspaper Washington Square News ranked Tampa as a top city for "twenty-somethings." There are lots of things to do in the Tampa Bay area - theater, music, professional sports, beaches, amusement parks, and more. But the most popular activities actually take place at people's homes - having family over for dinner, grilling out back with friends, swimming in the pool with the kids. If you're looking for a Tampa pool builder to turn your back yard into the perfect Tampa outdoor living space for you, your family and friends, we hope you'll consider Grand Vista Pools. 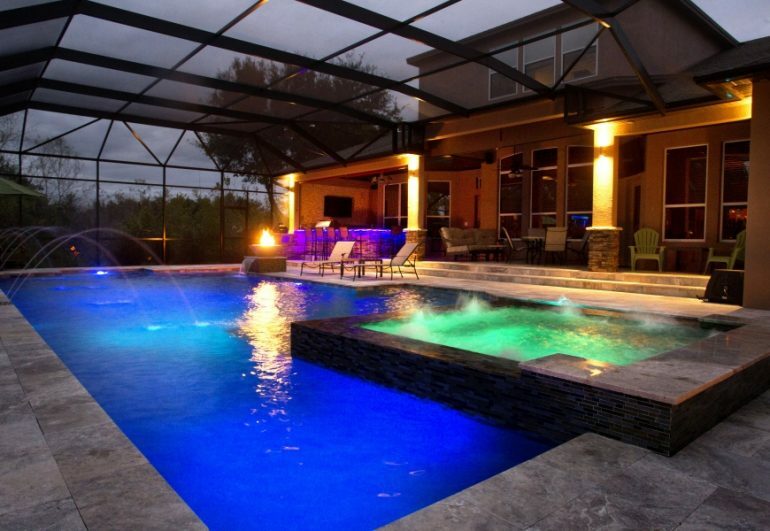 We've been building new swimming pools in Tampa, Florida for decades. What makes Grand Vista Pools unique is not only are we an experienced pool builder, but we are also a licensed general contractor, which means we can design and build your entire outdoor living space including any renovations to your home which may help your indoor living space flow to your outdoor living space. Got an older swimming pool that needs remodeling? No problem. We can do everything from basic pool resurfacing to an extreme makeover. Want to add a spa? Lighting, water or fire features? We can do that too. Grand Vista Pools also specializes in designing and building Tampa outdoor kitchens. If you can dream it, we can make it happen, from a manly outdoor grill to a full kitchen to a outdoor bar. Are All Trinity Pool Builders the Same? Spring – and the Tampa Swimming Pool Season – Is Here! What is Pool Resurfacing in Tampa? Does a Tampa Swimming Pool Need a Heater?